The Galco Cop 3 Slot gun holster is precision-molded and allows comfortable carry in both strong side and cross draw positions. A tension screw adjustment near the trigger guard ensures maximum retention of the gun, while the rear sight is protected by a wide safety strap and reinforced thumb break. The low-cut design of this Galco holster allows for easier, faster clearance of the firearm from the leather. The slots will fit pants belts up to 1.75 ". A very high quality holster for a handgun that's hard to fit Thanks. This holster is very comfortable. It was hard to break in but I stayed with the process of breaking in leather. Now it's a great fit for my Sig. Galco and CopsPlus are great to work with and their service is second to none I'm sure I will be a repeat customer for CopsPlus. I got a promotion at work and didn't need to wear a duty belt anymore. 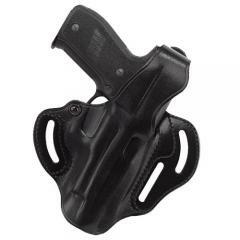 This is a great holster for what I need it for. It definitely did need to be broken in. I strongly suggest that you scroll down and watch the video on how to do it. Overall great holster. I love my GALCO COP 3 Slot Holster. It's the most comfortable belt holster I have ever owned. I recently purchased a new toy and it needed a new coat The break-in process instructions were straight and to the point. I love the holster. A little stiff at first but breaking it in little by little. Very comfortable holster. I will probably be purchasing this style holster for several of my different carry firearms. Galco makes the best holsters for just about any gun. I really liked the advise of breaking in the holster I saw on your video. My H&K compact 45 fits like a glove in it. Will this product fit a S&W Model 4044? It should work if you select "Smith & Wesson 4046". Does this work with a 5" 1911 cocked and locked or must the hammer be down? Holster is meant to be carried with hammer down. Yes, it will fit the Sig Sauer P226. Unfortunately this holster will not fit the Sig SP 2022.